Heavy gauge brass shell with spun over edges or laminated wood shell. The wood shell is not made from Plywood but built up from laminated veneer; this makes the very finest type of wood shell and as the thickness is approximately 3/8" it has enormous strength and the very finest possible tone. The fittings are of the latest model self-aligning, covered threads type and the rims are one-piece Die castings. 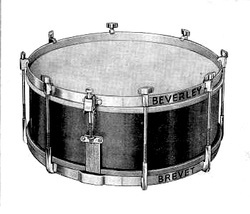 This is the cheapest drum of the Beverley range and it is fitted with a unique set of perfectly matched wire snares and with a very neat quick acting snare release as will be seen from the illustration. The tone of this drum is simply marvelous and it must be tried to be appreciated. There is no drum sold at anywhere near this price to compare with the Standard for quality and tone. 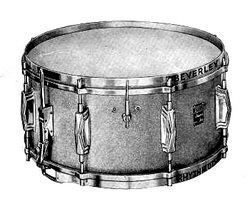 As Beverley Dual but without internal snares. See how the ACTUAL manufacturers can offer you a real "Pukka" Drum at a figure you can afford, with Colossal Improvements! Original Design! Reliability! and Tone! All internal parts of BEVERLEY Drums are rust-proof Cadmium plated! Brass shell, All nickel plated finish. Brass shell, All chromium plated finish. Wood shell, covered any "GLORY" Finish or Cellulose painted, Nickel plated finish. Wood shell, covered any "GLORY" Finish or Cellulose painted, Chromium plated finish. 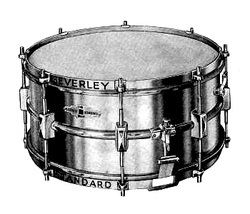 The "Rhythmode" Snare Drum is the first in the new range of "BEVERLEY" Snare Drums. Has all the special features of the Dual and Parallel, namely - 14" x 6½" Spun Brass Shell or laminated Veneer (not ply) Wood shell. 8" over all. Instantaneous "on" and "off" Tone Modulator for quick tone variations. Super White Calf and Slunk Calf Vellums by Jos Rogers (USA). Super sensitive Wire on Gut Snares. New pressed steel quick action Snare Release. By far the best Release ever manufactured. No rivets to work loose, nothing to break and definitely fool-proof. This is the second Drum to our new range of Snare Drums and embodies features to ensure Reliability and Excellent Tone. 14" x 6½" Spun Brass Shell or Laminated Veneer (not ply) Wood shell as used on the Dual and Parallel. Pressed brass floating counter hoops. Very neat trouble-free, quick action snare release of original design. Internal "on" and "off" Tone Modulator. Unique set of perfectly matched wire snares. Self-aligning Diecast fittings with covered threads. This is the third addition to our new range of snare drums and is very similar in specification to the "Standard". Unsurpassed for quality. The tone and response of the Vidom is 100 per cent. Try a Vidom at your dealers and hear for yourelf - we know you will be delighted. 14" x 5" Spun Brass Shell or Laminated Wood Shell. 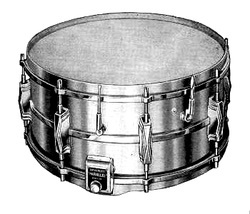 Snare release and snare wires as on the "Standard" drum. 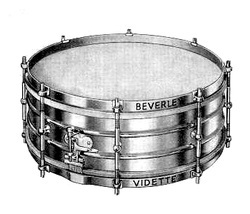 The new "Beverley" Vidette meets a huge demand for a good class Snare Drum at a reasonable price. 14" x 5" Spun Brass shell or Laminated Wood shell. Improved Quick Action snare release. Flanged counter hoops. Double tension fittings. Set of super sensitive snare wires. The Genius, so called for the inspiration which leads us to offer such value for money. A guaranteed "BEVERLEY" drum within the reach of everybody. 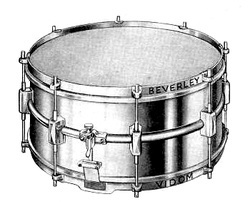 Snare release, improved pattern as on the "Vidette". Set of super sensitive snare wires. 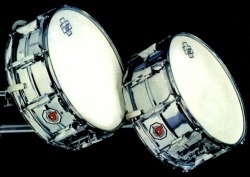 A drum that will defy criticism for tone and quality. The cheapest Snare Drum in the catalogue. This drum also incorporates a 14" x 5" Laminated Wood Shell and a set of super sensitive snare wires as used on the better quality drums. Whilst this drum is the cheapest of our range the tone must be heard to be appreciated. All fittings are heavily Nickel Plated and the counter hoops are rust-proof Cadmium Plated to ensure long life and stainless finish. A guaranteed Drum with Shell Varnished Finished and fittings plated or with Shell Black or White Cellulose finish and fittings plated as above. 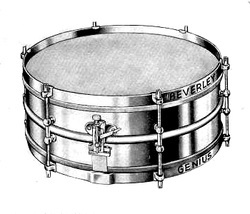 The new Beverley 10-lug metal shell snare drum was called ‘Cosmic 21’ because it cost £21. 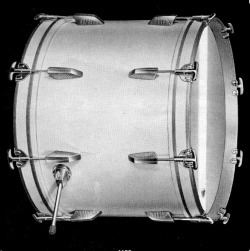 It became extremely popular in the UK and USA in the early '60s as it was as effectively a Ludwig 400 but less expensive. Vivid tone definition ensures that each beat comes through crisp and clear. Clean choke-free sound at all volumes. Instantaneous response - from a whisper to a roar. 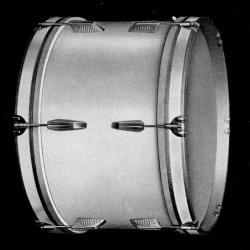 Unique snare strainer design incorporating 'micro-adjustment' tuning. No sound-deadening mechanism inside the shell. Eight new self-aligning counter-balanced tension brackets to each head. Triple flange counter-hoops for easier more powerful rimshots. Sticks last longer too. This beautiful drum has everything, especially a crisp and snappy tone. The shell can be finished in any of the Beverley glamour finishes to your choice. Everplay plastic heads are tensioned with a set of eight self-aligning fittings to each head. Triple flange hoops for easy, even tensioning. Famous New Era snares are fitted to a quick action snare strainer. Chromium plated throughout. A really fine snare drum of modern design and fine quality. The laminated wood shell is perfectly round and finished in any of the Glamour Pearl or Sparkling plastics. Triple flanged hoops, Everplay plastic heads, New Era snares and a modern snare release, chromium plated. This is a well-made drum for the small band - just right for the student drummer. Chromium plated throughout, Everplay Extra heads and with wire snares fitted to a reliable snare strainer and quick-action release. Wood seamless or all-metal seamless centre beaded shell, 10 lugs for proper tensioning. Simple, fadt, smooth snare strainer, no sound-deadening mechanism inside the shell.